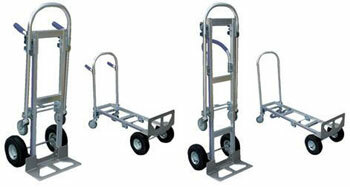 Deluxe Convertible Aluminum Hand Trucks. Maximize control for different types of loads. These hand trucks can transport boxes wherever they are needed. Transport loads smoothly and evenly over rough or uneven floors. The convertible hand truck has 10" x 3½" pneumatic tires and 5" x 1¼" poly-on-steel swivel casters. Optional stair guides are available. See table for specs. 20 1/2" x 19" x 52"
47" x 20 1/2" x 52"
20 1/2" x 19" x 61 1/2"
57" x 20 1/2" x 45 1/2"